The Fraser Institute has just issued a new report which finds that provincial healthcare spending in Canada is "unsustainable." The message to Ottawa and the provinces: act now before medicare bankrupts us, kills us or both. Following its almost-total destruction in the Second World War, Dresden's magnificent Lutheran cathedral, the Frauenkirche (Church of Our Lady), was re-consecrated over the weekend in a ceremony that included the Duke of Kent, and both Germany's outgoing chancellor, Gerhard Schroder, and its new one, Angela Merkel. The church was almost completely destroyed by RAF saturation bombing in February 1945, leading the Duke to say its rebirth was a "symbol of the reconciliation between Great Britain and Germany. Its destruction...was a tragedy." One expects that many commentators will weigh in on the significance of the comments -- on whether they amount to an unwarranted apology for waging total war against an evil enemy which itself had unleashed the concept of total war six years earlier. However, I am more interested in what will become of the church itself. Given Europe's precariously declining birthrates and its peoples' continuing abandonment of the religion of their forefathers, I fear the building will be little more than a quarter-billion-dollar monument, not only to the Second World War, but also to the continent's Christian heritage, rather than a new centre for a vibrant Christian community. * Support a western Canadian artist: 2006 Country Calendar now on sale. Oh, this one is definately a treat! "Families go and begin to disguise their children as witches," Chavez said. "That is contrary to our ways." In one odd incident a week ago, authorities found more than a dozen jack-o'-lanterns left in spots around Caracas bearing anti-government messages and what appeared to be bomb-like fuses. Police and firefighters removed the pumpkins with caution, though the jack-o'-lanterns reportedly bore messages saying they were not explosives. Paper skeletons bearing anti-Chavez messages also have appeared in spots across Caracas recently, and government officials have blamed sectors of the opposition with aiming to create chaos. So the people of Venezuela have found a unique medium for their rebellion...Good for them! At the very least, they were successful at prompting Hugo to a response that made him sound like a delusional, petty idiot. I didn't think it was possible, for anyone to top us Canadians at knee-jerk reactions to anything American, but Hugo has proved himself quite adept at it! he urged parents to think about whether it was appropriate to dress up their children as part of a foreign custom, calling it "the game of terror." He said that is part of the U.S. culture -- "terrorism, putting fear into other nations, putting fear into their own people." LOL! Only Hugo would admit - out loud - that a 6-year-old, dressed in a bedsheet and holding a bag of candy, inspires terror and fear! The Toronto Star spoofs our Caribbean Cruise (free registration required). My only objection is that they called me middle-aged. 7:00 p.m., Thursday, November 3rd, on an "@iSSUE" hosted by John Robson on ichannel. It's a panel on "Religion and Politics," with Fr. Tom Lynch of St. Augustine's Seminary (Toronto), Harry Kits of Citizens for Public Justice (Toronto), a rabbi whose name I never did catch ("sorry"), and "Yours Truly" of the Work Research Foundation (Hamilton). Go see it to count how many double-chins I have (it really is time to get back to the gym!). Millions of taxpayer dollars later . . . Tap water at a remote Northern Ontario native community in the grips of an emergency evacuation is good enough to drink, according to the technician sent in to take over management of the Kashechewan water treatment plant. Chris LeBlanc, a process expert with Northern Waterworks Inc., said he is drinking and showering in the troubled community's water. What was the problem then? It may be that the folks hired by Ottawa to run the water treatment plant were unqualified to do so—as are 61 per cent of water treatment managers across the country. All the diseases that have been blamed on the water—from crabs to impetigo—are more likely the result of cramped living conditions and high rates of diabetes (which increases infection risk). But hand it to the federal Liberals, they're prepared to see this centrally-planned reserve system through, no matter how long it takes or how much it costs, until they get it right. I'm sure you've all noticed that this blog has been operating very poorly lately, and my apologies for that. The blog service that we use, Typepad, has been severely underperforming, causing many slow loads and down periods. Over the last few days, we at the Western Standard have been evaluating possible alternatives to Typepad, and we have come up with some. But I just today received an advisory from Typepad's CEO (yes, THE Barak Berkowitz), assuring us that the firm is in the midst of rapid and significant infrastructure upgrades, and assuring us that the service will be operating at optimum levels by the end of next week (apparently it will require a bit of down time on Saturday night, so watch out for that). So, let's give Barak the benefit of the doubt and watch for some considerable improvements in this blog's performance. Let's use this thread to report any progress or lack thereof. If we're not satisfied, we've got a back up plan. And please be patient and continue to bear with us here at the Shotgun. Cpl. Jeffrey B. Starr died on April 30th, several months after he wrote the passage quoted above in a letter to his girlfriend. It would seem hard to do but check out how the NY Times used the passage to slander the memory of a fallen soldier. Any man who would give his life in the service of others deserves our everlasting gratitude. Any man who would insult the other's memory... what he deserves I'll leave up to you. Separatist to receive separate prize money than that awarded by the Queen's Canadian vice-regal and disavowed crypto-separatist. Money to be raised by separatist Member of Canada's federal Parliament. Just so we're clear, this has little to do with the concept of our country, yet it is so typical of it. The Vancouver Sun has just published a Washington Post review of the new George Clooney movie Good Night, and Good Luck (Clooney stars, directs and shares writing credit). Read it and cheer. Finally, someone in the mainstream media has shined a light on Hollywood's propaganda machine. The movie, as reviewer Stephen Hunter points out, omits more than a few pertinent details about the McCarthy era and its key players -- details which undercut Hollywood's traditional black-hat, white-hat view of that troubled time. and to provide meaningful solutions. what can and should be done." front line law enforcement officers and community workers. As with the others agreements, there will be a requirement that the province must account to its own people about how the money is spent. But, unlike the others, there will be no demands that the money is to go specifically toward child care. It could, instead, be used for "related objectives for the well-being of families." But don't worry that this deal may be borne of Quebec's much-rumored attitude of superiority, over Canada...Oh my, no. Transport Minister Jean Lapierre, Mr. Martin's Quebec lieutenant, was even more direct. Well, obviously! Now, I feel better -- don't you? I am not a fan of the National Daycare initiative...In fact, I think it stinks. It's just another way for the socialist government to gnaw through the tensile strings that hold families together. It is a high-cost program, that will ensure children see their parents less -- and parents appreciate the costs of raising children less. As with any program designed to benefit those who do not work for what they get. Aside from that though, If you are going to foist it on the taxpayers, do you think it would be too much to ask for it to be implemented fairly? Well, it would seem as though it is. I have a question for Paul, and the supreme beings of Quebec. Pardon my French, but would you mind lubing me up a bit next time, before you throw that big fat French sausage in my behind? It's starting to chafe. Dammit! And I haven't even had my coffee, yet. Math's never been my strong suit—in fact, it isn't for most journalists, which is why I'm wondering about the numbers in this story of David Dingwall's "exoneration" from the Canadian Press (via the Sun). An audit, requested by the mint, by PriceWaterhouseCoopers, writes Joan Bryden, "reviewed expenses of almost $1.8 million over three years, the vast majority of which went to pay salaries for Dingwall and his staff and for administration of the mint president's office." Then, she writes: "The audit found 0.36 per cent of the expenses were not legitimate . . ."
And then she quotes Dingwall saying: "the questionable expenses amount to about $2,500 and include charges to courier his schedule to his wife in Nova Scotia and a portion of some travel expenses for trips that included some free personal time." Huh? What's 0.36 per cent of $1.8 million? My calculator says $64,800. This whole story, remember, is run under the headline: "Audit probe clears Dingwall"
So here's my question: If being caught appropriating $2,500 of public funds is no biggie, according to Dingwall (I'll have to check if the same policy applies at my workplace), then what about $64,800? Is that still ok? I think Canadians deserve an answer: What is the maximum amount of money that a public servant can filch before it's considered a problem? MEA CULPA UPDATE: Ok. So I was right. Math isn't my strong suit. Especially when I'm trying to crunch numbers at 11:30 at night. Today, my calculator says .36% of $1.8 million is $6,480—not $64,800. It's still a lot higher than the $2,500 quoted in the story, but I guess it's more likely to fall within the acceptable threshold for public servants to help themselves to and still remain above reproach. Transferring $53 million in lottery sales made primarily in Ontario and Quebec to 17 oil field workers in Sedgewick, Alberta- Priceless! If you're one of the millions of Canadians who found themselves suddenly thinking reasonably while CBC workers were walking picket lines in recent weeks, and didn't like how it felt, be sure to tune into tonight's Passionate Eye feature about the beef industry. It'll set you right again. How could it be anything but a balanced and thoughtful look at the business of beef—with a name like "Frankensteer" ? According to Mike McBane of the Canadian Health Coalition, "When you bring a package of hamburger home from a supermarket, you have to treat it as toxic material…"
is being taken entirely out of context. I have no idea why a front group for the nurses' union, whose mission and goals are exclusively dedicated to preserving medicare, would even be consulted by any responsible journalist on the question of food safety in the first place. But that ellipsis tells me that McBane might just be talking about washing your hands after handling raw hamburger. Just a hunch. The National Post is having a contest to see who is the most influential Canadian intellectual. Here's my nomination of the Fraser Institute's Mike Walker, and here is the list of the rest, including nominations put by Shotgun bloggers Colby Cosh, Marni Soupcoff, Adam Daifallah and Lorne Gunter. Our senior columnist, Mark Steyn, is nominated, too, by Western Standard subscriber Barbara Kay. I admire each of the nominees proposed by my friends above. But I think there is a difference between those we wish had a public importance and those who have actually achieved it. I regret that there are many great Canadian public intellectuals whose ideas have not found purchase in our infertile socialist soil; my choice, Mike Walker, is one of the few who can claim achievement, not just effort. My weekly "debate" column in the Tri-City News continued uninterrupted last weekend with Cynthia Van Ginkle, a young Port Moody council member who is not seeking re-election, stepping up to the plate to replace Mary Woo Sims, who is now seeking a spot on Coquitlam council. Our first subject was global warming. Read my column here, and Cynthia's here. Cynthia's view was a mainstream green one, while I advanced a cautious, skeptical position about global warming, and opinioned the rather unoriginal viewpoint that money spent reducing CO2 emissions would be better spent on medicines and clean water. My position generated two letters to the editor from unimpressed readers, here, one of whom suggested that questioning global-warming orthodoxy was akin to arguing the world is flat. Ouch! Anyway, feel free to write editor Richard Dal Monte with your own thoughts on this issue. His email address is [email protected]. Brought to you by Little Green Footballs, where Charles Johnson is hosting a "Grim Milestone Watch". Is It Time to Scrap the Food-Aid System? When we read about famines, our first reaction is to want to send food. Most of us are caring people who are deeply disturbed by the continuing famine in some areas of the world. At the same time, when famines recur at frequent intervals and when we despair about whether the famines will ever become a thing of the past, it is time to question the way food-aid is delivered. "The food-aid equation actually hurts Africa more than it helps," says economist James Shikwati, director of the Inter Region Economic Network in Nairobi, Kenya. "If it was helping," he says, "the problem would be solved by now." In fact, he sees it as fundamentally unethical. "You can't say you're helping people if you're not helping them" break the cycle of famine. African politicians use hunger as a tool to gain votes, he says. Western relief agencies use it to fund-raise. This creates a "manna mentality" where Africans wait for bread "to drop from heaven." And once again, the system faces a major test in southern Africa, where 12 million people are reportedly on the verge of hunger. How long will it take for people to realize that raising the height of the social safety net affects people's incentives? Why produce food if others will provide it? Why produce food if others are going to undercut and depress the prices I might receive? State [provincial] and local taxes matter. Deputy Conservative leader, Peter MacKay rose in the House today to speak of the contradictory positions given by PM Paul Martin and his Deputy PM Anne McLellan. One more thing. According to Chief Whiteduck, the family name of Brazeau is common enough in Maniwaki. I haven't figured out if Frank Brazeau, who seems to play a major part as the "inside man", came from this branch of the family. If he did, one wonders just how far back Smith and Brazeau go. Brazeau is from our reserve and is an aboriginal...Smith is from Maniwaki but is not an aboriginal. Funny coincidence, but Smith and Brazeau are related on their MOTHER's side both of whom are french quebecers. Smith's mother ... Suzanne Clément Smith and Brazeau's grandmother ... Thélorèse Clément Fournier are sisters. That means Brazeau's mother and Smith are direct cousins. Wow! This means that Frank Brazeau, the bureaucrat suspended without pay over the bad contracts, and Liberal MP David Smith, former owner of the company Abotech that profited from those same contracts, are related! A "funny coincidence"? Or evidence of a conspiracy between cousins who grew up close to each other, one a Liberal member of parliament, and the other a bureaucrat in the department in charge of allocating contracts to aboriginal firms, and also the former secretary of the Liberal Party riding association for that very same Liberal MP? Remember that Brazeau became the secretary for the Liberal association right after the 2004 election, the same election that saw David Smith first elected for that riding. If this information is good, this is amazing! I wonder if the RCMP is reading this. That's the opinion of the Chief of Kitigan Zibi Band in Maniwaki, Quebec, where Liberal MP David Smith, who is embroiled in the Abotech affair, grew up. I know because I spoke to Chief Jean-Guy Whiteduck an hour ago. It's not just the Chief. His receptionist, another person in the band with whom I've had several email exchanges, David Smith's high school teacher -- all agree that David Smith's claim to be an aboriginal is bogus. On what specifically could David Smith base his claim? It might have something to do with the farm he grew up on, which is part of the band lands. If you grow up on native lands, doesn't that make you a native? Perhaps, but when he grew up, the farm was not part of the band lands. It was an enclave inside the band lands that was not owned by the band. It is actually subject to a land claim fight, but in the 90s (Chief Whiteduck could not be sure of the year), the band simply bought out the owners for expediency. So technically his home is part of the band lands, but only recently. Could David Smith have decided to become an aboriginal when his family farm was bought? After that, creating Abotech in his home and engaging in a scheme to land contracts from the Procurement Strategy for Aboriginal Business with the help of Frank Brazeau seems at least to be a feasible story. Iraqi constitution vote "a farce"
Iraq's constitution was adopted by a majority in a fair vote during the Oct. 15 referendum, as Sunni Arab opponents failed to muster enough support to defeat it, election officials said Tuesday. A prominent Sunni politician called the balloting "a farce." It is assumed that Sunnis don't accept results of less than a 100% majority on a 100% turn-out, as was the norm pre-2003. Is it "the profit, only the profit, and nothing but the profit?" Or, are there motives other than the profit motive that figure in as well? Go to Burkean Canuck for a summary of the Reason interchange and analysis. Mr. Pierre Poilievre (Nepean-Carleton, CPC): Mr. Speaker, Frank Brazeau, the secretary of a local Liberal association and a public servant, used his influence to secure $1 million in contracts for the Liberal member of Parliament for Pontiac. The KPMG auditing firm has found irregularities in contracts totalling $15 million also given by Mr. Brazeau. Will the Prime Minister release KPMG's report now? Otherwise, what is he trying to hide? The response was the standard "Can't talk, Ethics Commissioner, all hush-hush!" Frank Brazeau was a contracting officer at Consulting and Audit Canada whose performance came under the scrutiny of auditors at KPMG. In their recent report, the auditors raised allegations of irregularities in Mr. Brazeau's handling of contracts, finding a lack of documentation, backdating of contracts, manipulation of requests for proposals and irregular invoices. Mr. Brazeau was initially suspended with pay, but he is no longer receiving a salary "pending further review," according to a senior federal official. It's amazing. He helped coordinate the PSAB program for Indian and Northern Affairs Canada. What is PSAB? Procurement Strategy for Aboriginal Business! So there is the link to contracts that are supposed to go to aboriginal business. As I suggested earlier, I wondered if David Smith's Abotech was a front for non-aboriginal business landing work that was supposed to be set aside for aboriginal businesses. How many more aboriginal friends of Liberals are riding this gravy train? And was Brazeau rewarded with any "success fees"? Is Infant Mortality a Good Measure of the Quality of Health-care Systems? Infant mortality comparisons are tricky things. For example, mortality risk is closely linked to birthweight: low birthweight means high mortality risk. With that in mind, let's look at some detailed figures from the same periods as those averages were calculated for. In these figures, "g" is grams, and 2500g and up would be normal birthweight. 1500 - 1999g: 28.7 in Canada, 29.0 in the U.S.
2000 - 2499g: 12.4 in Canada, 12.5 in the U.S.
>2500g: 2.3 in Canada, 2.6 in the U.S. The infant mortality rates in the U.S. are slightly higher than those in Canada in these weight ranges, but the difference is VERY slight (what statisticians would call statistically insignificant). The data presented by Brian Ferguson show that the differences go the other way for babies born with very low birth weights: the infant mortality rate is higher in Canada in the U.S. There are many more data available at his site, along with his usual pithy discussion and analysis; please read the whole thing before dashing off a comment here. While there are many possible explanations for the differences, one conclusion that emerges is that rough comparisons of infant mortality rates are probably not a good indication of the overall quality of medical care. B.C. teachers are back at work now, their tails firmly between their legs. While it is true the B.C. Liberals did end up negotiating with the teachers (and thus deserve some criticism for bargaining with blackmailers), they didn't give the illegal strikers anything firm in the way of expensive class-size reductions or wage increases. And so the teachers were the bigger losers. Perhaps the most lasting impact of the strike will be the lessons the union taught their students by its disrespecting both the law in general, and the specific facts surrounding their walkout. Right until the bitter end, Jinny Sims was saying her members were not on strike, but were staging a political protest. This lesson in self-serving deconstruction of fact is bound to be much appreciated by the next student caught cheating on an exam: "Hey, I wasn't cheating, I was merely obtaining answers from an alternate information source..."
Sims also consistently shrugged off her union's contempt of court, suggesting that any penalties the BCTF might have to pay were merely the price of doing business -- just like a drug kingpin might calculate when weighing the potential profit he might make from a deal against the potential fine he might pay. I'll give the final word to Madam Justice Brown, who slapped the union with a $500,000 fine last Friday. "It is not enough to pay lip service to the courts; it is the duty of all citizens to put the statement into action, to obey court orders. Equally, it is the duty of the court to protect the rights of all citizens by appropriately sanctioning contempt of court." Complete text of her ruling is here. Who runs this joint, anyway? Shame on every British bank that would impliment such an idiotic capitulation, and shame on every Briton that would patronize such an institution. Poor Piglet...Just can't catch a break. XM Radio.com - Over 150 digital channels! XM Radio.ca - 80 digital channels! Ya, I think I'll be keeping my US sub. Steyn just wrote a column in the WS about Canada's infantile nature. I'd submit XM Radio.ca as exhibit 1. Let me stress here - the Canadian sub offers nothing the US sub doesn't; just less. Now, Canadian consumers aren't totally ignorant. It remains to be seen if the CRTC - in limiting the amount of choice & decisions Canadians can make - has overplayed their hand on this one. Monte Solberg is backing down on David Dingwall. Because, as the LIberals have been busy pointing out - not just any idiot can make money at a Mint. The Parliamentary Press Gallery's annual display of self-immolation, er, skewering by the party leaders and the G-G was excerpted on yesterday's edition of CTV Question Period with so-old-he's-now-ageless Craig Oliver and gossipy Jane Taber . . . for more of "The Press Gallery dinner's rubber chicken," go to Burkean Canuck). 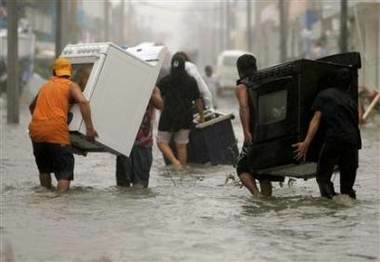 It is reported that Mexican hurricane victims in Cancun have begun eating kitchen appliances to survive. In the most fetid swamplands of leftwing British academe, it is not enough to condemn Bush, Blair and the Iraq war while endorsing all Palestinian claims to the West Bank and Jerusalem. New rules require that you also punish Israeli professors and make them suffer for what you regard as their country’s sins, even if the particular professors are critics of the Israeli government. This argument, sometimes called the Academic Intifada, looked like a temporary aberration when it surfaced three years ago. Today it’s become a permanent (though by no means triumphant) belief among certain intellectuals. ... The British may disapprove of the Chinese government but no one proposes banning academic relations with China — or even with the U.S., which many British professors regard as the world’s most dangerous nation. Only Israel has been selected as a target for boycotting. Can Nurse Practitioners Help Reduce Medical Costs? There is a way to bring NPs into our health care system, and to do it quickly and relatively easily. It won't happen, because it involves letting the market work... [I]n the real world of Canadian health care policy, all that will happen is that we will continue to fall further and further behind the US in the use of NPs and the like. We'll have endless meetings whose participants do nothing but bicker, and we'll produce lots and lots more glossy reports saying that NPs would be a really valuable addition to our heath care system and that the stakeholders will be getting together to try and figure out how to integrate them into Medicare ..................... And we'll continue to have a shortage of providers of primary care, and those of our nurses who would make really good NPs will go to the US, where the market says they're highly valued. But at least we'll still have a publicly run health care system, and ultimately, that's all that matters, isn't it. To his credit, my family physician works with a nurse practitioner. Alberta has impeccable credentials to become [Newfoundland's] mentor. By pure dumb luck, Alberta possesses the oil resources of a Saudi Arabia. It's as if they won a gigantic lottery without even having to buy a ticket. And they carry on now as if they invented the oil themselves rather than merely stumbling upon it already there. [That's why the streets are paved with gold in oil-rich Nigeria and Venezuela. - Ed.] Plus, they chastise the rest of us for not being intelligent and hard-working enough to have their wealth and low income tax rate and no sales tax. You've got to love their chutzpah. And will they share any of their windfall surpluses with the rest of us benighted idiots across Canada? Yeah right. Freeze in the dark, eastern bastards. Moreover, Alberta's oil industry spews out many times more atmospheric pollutants than any other province, for which the rest of Canada has to bear the financial brunt internationally. But no sir, no sharing of their fluky oil revenues. Indeed, many Albertans would still like to dig up Trudeau and put a stake through his heart for daring to make them share during the 1970s energy crisis. Never mind that as oil revenues increase and the Alberta economy booms, Albertans will pay millions more into federal equalization programs. Never mind that no one ever complains about Quebec refusing to share its massive revenues from hydroelectric power with the rest of Canada. Never mind that no one ever snarks about Ontario being "just lucky" in being right next door to the massive American market, making it a prime location for American (and Japanese) branch plants. Never mind that Alberta and Newfoundland, which is trying to build its own resource-based economy free of Ottawa's meddling, are natural allies. And never mind that the Albertan oil boom has provided high-paying jobs to thousands of Newfoundlanders - some cities, like Fort McMurray, are practically Newfoundland colonies - who would otherwise be stuck scrounging for enough weeks of work to collect Employment Insurance. Never mind all that. Alberta has oil, oil is expensive right now, and they should share the wealth. But they better not get uppity and think they should have any real say in how this country is run! I have no more respect for "Alberta separatists" than I do for their Quebec counterparts. But at times like this, I have to admit, I can sort of see where they're coming from. One of Harriet Miers's responses to the U.S. Senate Judiciary committee's questionnaire answers the following: "No. 28. Judicial Activism: Please discuss your views on the following criticism involving 'judicial activism.' " This is Ms. Miers's reply . . . (for more, go to Burkean Canuck). Gives the lie to suggestions that Ms. Miers is a less than formidable legal intellect . . .
Should I Podcast My Introductory Economics Lectures? Several days ago, John Chilton sent me this article about professors who podcast their course lectures. Since I have been involved with several Radioeconomics podcasts in the past few months, that article prompted me to think about whether I, too, should put audio versions of my lectures on-line for students (and others?) to download. When I asked my intro students if they would be interested, over half seemed quite enthusiastic, for what it's worth to judge enthusiasm from a show of hands in a classroom. I have posted a list of my thoughts/questions/concerns at The Eclectic Econoclast. I would greatly appreciate suggestions and feedback on this question. Why does David Frum have it in for Harriet Miers? David Frum carries on his campaign, here, against the U.S. president's nominee for the U.S. Supreme Court, Harriet Miers. Frum is leading the charge of "legal conservatives" against the nomination while Marvin Olasky and other evangelical conservatives are leading the support campaign for the Miers nomination. A web site from Progress for America supporting the Miers nomination is here. Miers's lack of a record on key, legal conservative crusades and associations. For more on "Why does David Frum have it in for Harriet Miers? ", go to Burkean Canuck. "In other words, democracy is nice — eventually — but the bigger issue is kicking over the status quo in the Middle East and forcing change. And the hawks would argue that this is happening. Slowly and fitfully, to be sure, but let's count up the successes so far: Iraq and Afghanistan are better off than before, Libya has given up its nuke program, Lebanon's Cedar Revolution is a sign of progress, Egypt has held a more open election than any before it, and the Syrian regime is under considerable pressure. Did the invasion of Iraq precipitate these changes? I think the hawks considerably overstate their case, but at the same time they do have a case. Even if Iraq is a mess, it might all be worthwhile if it eventually produces progress toward a more open, more liberal Middle East. At the very least, it's an argument that needs to be engaged." I think the critics overstate their case, and rather consistently ignore the good news that Kevin notes. My anonymous emailer thinks that U.S. casualties are proof of a quagmire. That's an odd formulation, since it means that any war in which troops are killed, which means pretty much any war generally, is a quagmire. There's no question that some antiwar folks think that's true, but pardon me if I'm unimpressed with that argument. (What I said here in 2003 about antiwar folks being disappointed that things had gone so well seems to remain true, as people keep making every effort to portray Iraq as Vietnam). Saddam's on trial, Iraqis are counting ballots, and as noted above we seem to have shaken things up -- though I'd argue not enough yet -- throughout the mideast. If Bush's effort here fails, it won't be because the antiwar critique of bloodthirstiness and warmongering is correct. It will be because Bush hasn't been vigorous enough in toppling governments and invading countries in the region. What happens with Syria in the next little while may answer that question. If it's the number of US casualites that the antiwar set is hanging their "quagmire" definition on, then it's pretty safe to say their arguments are largely disingenuous - or historically dyslexic. MSK, who, with his three Pakistani brothers, raped several girls at their Ashfield family home over six months in 2002, was affected by "cultural conditioning" in the context of intoxification", Stephen Odgers, SC, told the NSW Court of Criminal Appeal yesterday. The assassination of former Lebanese Prime Minister Rafik Hariri is sending shock waves all the way to Damascus. The just released Mehlis Report is at the epicenter. It implicated Syrian and Lebanese intelligence chiefs and military generals, all the way up to members of Assad’s family. The commission was also extended up until December in order to allow for further investigations into more recent developments and leads. And, speaking of those leads, Mehlis deleted the names of some of those suspected of conspiring in Hariri's murder for reasons not yet known. The reasons were "Kofi Annan". Roundup and updates at Instapundit.